NETWORK UPDATE: Both THE BLACKLIST and SCANDAL gained 0.1 in final Thursday numbers, as did GREY’S ANATOMY and both episodes (the original and the rerun) of THE BIG BANG THEORY. (There was no change for ALLEGIANCE.) The only loser was THE VAMPIRE DIARIES, which lost 0.1 to return to last week’s 0.7 rating. On cable, WWE (Syfy) was once again in the lead, although down 0.09 from last week to 0.76. TNT’s NBA doubleheader had slots 2 & 5, at 0.73/0.57. 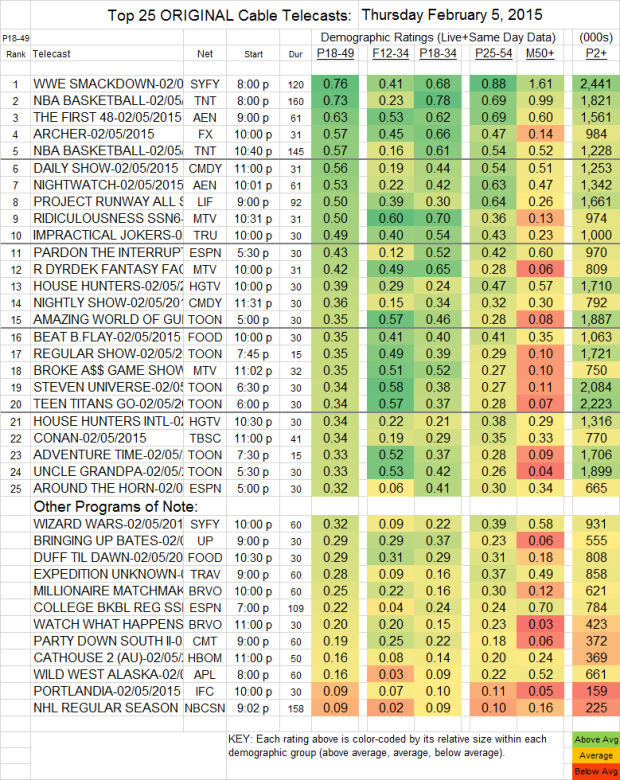 A&E’s THE FIRST 48 lost 0.02 to 0.63, with NIGHTWATCH also down 0.02 to 0.53. ARCHER (FX) dropped a heavier 0.16 to 0.57. PROJECT RUNWAY ALL STARS (Lifetime) grew by 0.11 to 0.50. MTV’s RIDICULOUSNESS fell 0.04 to 0.50, and ROB DRYDEK FANTASY FACTORY fell the same 0.04 to 0.42, with BROKE A$$ GAME SHOW at 0.35. Bravo’s MILLIONAIRE MATCHMAKER was at 0.25. PORTLANDIA (IFC) slipped 0.02 to 0.09. BABYLON (Sundance) didn’t make the chart, but it was at 0.01 in the demo, with 73K total viewers–actually way up from last week’s 0.003/17K. BREAKING GREENVILLE (Tru) also isn’t on the chart, and it was at 0.12/289K, down from last week’s 0.20/385K. Note: we continue not to have any access to ratings for Pivot or FORTITUDE.